Thomas Johnson, associate vice president and chief of Strategic Initiatives and interim dean of the George Herbert Walker School of Business and Technology, addresses the crowd during a press conference announcing the formation of the MCCOE. EDWARDSVILLE, ILLINOIS - The Leadership Council Southwestern Illinois today joined with partners from Southwestern Illinois College (SWIC), Webster University, The Aegis Strategies Foundation, and leaders from St. Clair County and Scott Air Force Base (AFB) to announce the launch of the Midwest Cyber Center of Excellence (MWCCOE). The new non-profit organization has been formed to address unprecedented needs in the cybersecurity labor market being projected by local military, financial, healthcare, government and law enforcement agencies. 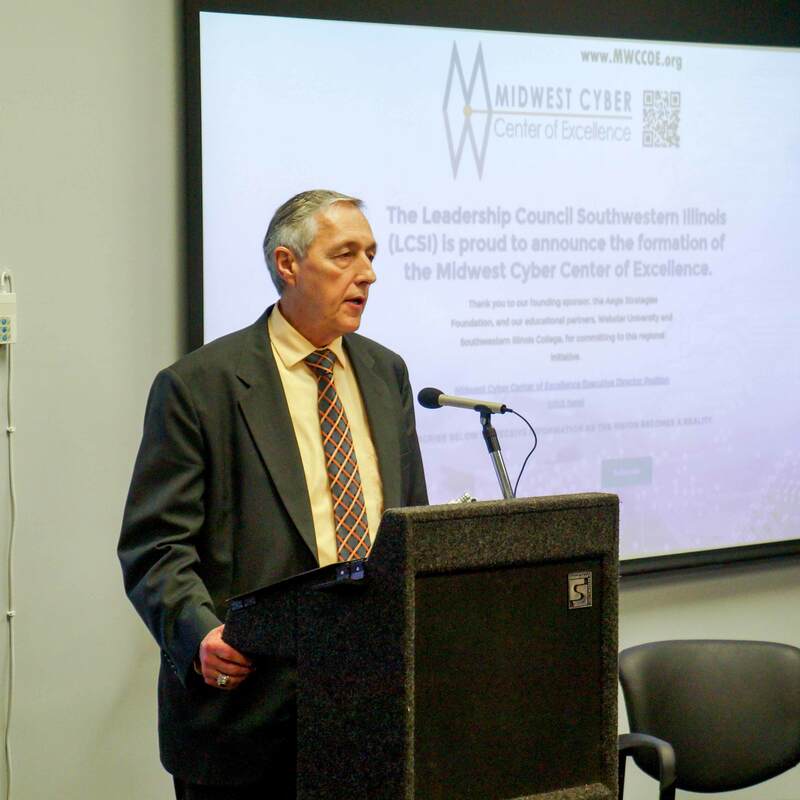 In recent months, the Leadership Council Southwestern Illinois led a working group at the request of Scott AFB leadership to evaluate the viability of a cybersecurity center of excellence in the Midwest. The St. Louis Regional Chamber contributed to the effort, authoring a research report analyzing the specific cybersecurity workforce needs. “The report revealed that, while other centers of excellence exist on both coasts, there is nothing comparable in the Midwest, and the conditions here are not only favorable to such an endeavor, they demand it,” noted Mike Riley, president of the Leadership Council, a founding partner of the MWCCOE. Among the other founding partners are the Cyberspace Research Institute of Webster University and Southwestern Illinois College (SWIC), both of which have a long history with Scott AFB and offer needed certifications and graduate degrees in cybersecurity. Additional plans are to align efforts with Southern Illinois University-Carbondale (SIUC) to integrate their National Security Agency certification into the offerings at the new center. The Aegis Strategies Foundation is the charitable arm of Aegis Strategies, LLC, a local, veteran-owned defense consultancy located immediately outside Scott AFB at 735 Seibert Road. Aegis has stepped up as founding partner to fund the executive director and supporting staff, as well as to donate space to initially house the MWCCOE at its state-of-the-art training center and lab facility. Aegis will also design, host and manage a dedicated website which will launch at www.mwccoe.org. The top priority of the MWCCOE is workforce development, first in relation to the growing cyber footprint at Scott Air Force Base, including the new Cyber Readiness Support Squadrons, but secondarily in relation to the many other cyber-intensive industries operating across the St. Louis region, such as finance, healthcare, government, etc. The Center also will work to raise public awareness of cyber security issues. Raise further awareness through potential partnerships with other local institutions. The second phase of the MWCCOE will engage in cyber-oriented research and development and entrepreneurial activity. Webster University’s Cyberspace Research Institute will donate expertise and services in the form of advanced training in its M.S. degree in cybersecurity, other professional courses, a cybersecurity threat detection certificate, and will play a key role in getting the CyberPatriot Program off the ground. Trainees at the Center of Excellence will have access to virtual laboratories housed on Webster’s St. Louis campus. Dr. Georgia Costello, President of SWIC, shares that enthusiasm. SWIC will provide access to computer labs and training space at our campuses to support the MWCCOE and will provide classes for needed certifications such as the CCNA Security, Security + and Network +. The community college will also assist with grant writing, marketing and Career Center Services. Future partner, Southern Illinois University Carbondale, is recognized as having one of the nations’ elite programs in cyber security. SIUC’S Center for Academic Excellence for Information Assurance and Security Education has earned this prestigious certification by the U.S. National Security Agency and Department of Homeland Security. Only two such designations exist in Illinois. A search is now underway for an executive director to take the reins and oversee the operations at the Midwest Cyber Center of Excellence, with support from a board of directors initially comprised of representatives of the various founding partners. Interested applicants can find out more about the position at www.leadershipcouncilswil.com. For more information, visit www.mwccoe.org or call (618) 692-9745.